From the owners of Hartsyard, a restaurant with a cult following in Sydney, Australia, comes a book of 100 recipes for "dude food that's not dumb." It's American Southern-style cooking at its best, perfected by Gregory Llewellyn, a New York chef who moved around the U.S. honing his skills, then helped open fourteen restaurants along the East Coast before following his Australian wife, Naomi Hart, to Sydney. These restaurateurs believe in "leaf to root, nose to tail" cuisineusing the entire food sourceand they practice back-to-the-land food production in their culinary adventures. 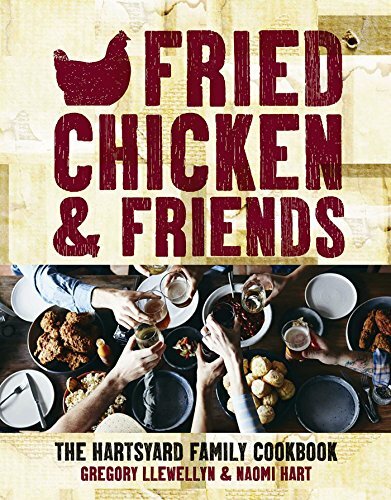 Under these principles, the recipes in "Fried Chicken & Friends" are surely the most flavorful dishes in both hemispheres. As the Hartsyard motto goes, "Good food makes good memories. It should be savored and shared in fine company."" Husband and wife team Naomi Hart and Gregory Llewelyn are Australian Americans whose restaurant Hartsyard in Sydney has become a mecca for lovers of southern-style cooking done to perfection. Gregory has worked under Daniel Boulud, Alain Ducasse, and Andrew Carmellini.